A way to straighten your teeth without metal wires and brackets – sounds too good to be true, right? Well surprisingly, it’s not! With the world’s leading clear aligners, you can achieve a beautiful, straight smile without having braces. Sometimes Invisalign® isn’t suitable for everyone. But don’t give up yet, your Discovery Dental team has put together all the facts and information you need to determine if you are an Invisalign® candidate. And don’t forget to check out our limited-time special where you can get $2,400 off Invisalign®. Invisalign® uses nearly-invisible, removable aligners to gradually move your teeth toward the projected final position. These aligners are tailor-made to comfortably fit over your teeth using cutting-edge technology. Complimentary consultation: You and our certified Invisalign® provider, Dr. Madhuri Vanama, will discuss your smile goals and needs, and evaluate your best treatment plan. Custom treatment plan: With an iTero® scanner, we will take fast, 3D digital images of your teeth – no goopy impressions. Using those images, Dr. Vanama will map out your treatment plan, including the exact movements of your teeth and how long treatment will be. Bonus: You can even preview your final smile and all the projected movements. 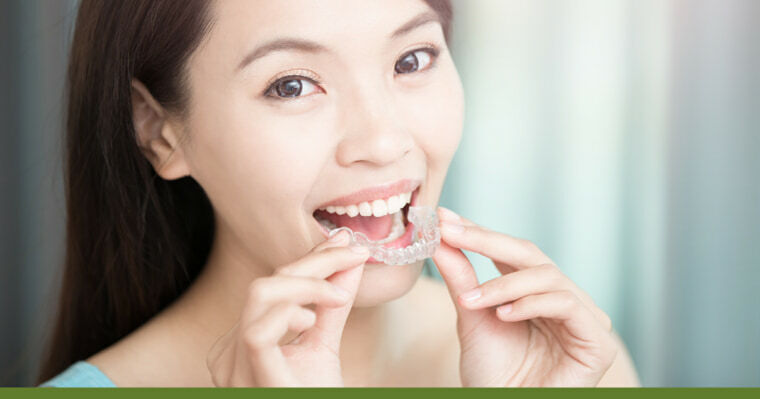 Start wearing aligners: Shortly after, you will receive your custom-made aligners. For best results, you will need to wear them 20-22 hours a day and only take them out to eat, brush, and floss. These aligners are so clear people may not notice you are wearing them. Progress: Every one to two weeks you will change to a new set of aligners, ensuring your teeth continue to move little-by-little, day-by-day. Because you won’t need adjustments like braces, you will only schedule check-ups every six weeks or so. Straight smile: Ta-da! You will complete treatment with a beautiful, straight smile! To keep your smile in alignment, we can make you a Vivera® retainer. Even better: If you sign up for Invisalign® at Discovery Dental you can receive $2,400 off treatment! Keep reading for more info. My teeth have a (fill in the blank). Am I an Invisalign® candidate? The general answer is: Yes, Invisalign® can straighten a broad range of cases. However, the only way to know for sure is to schedule a complimentary consultation with Dr. Vanama and let the expert, and technology, do the talking. Gapped teeth: This one is pretty self-explanatory – missing teeth, spaces, teeth shifted and now there’s a gap, etc. These gaps can lead to gum problems or periodontal disease. Overbite: When your upper teeth extend over your lower teeth. An unresolved overbite can lead to gum issues, wear on the lower teeth, and cause painful jaw or joint problems. Underbite: The opposite of an overbite – when your lower teeth distend past your upper teeth. Underbites can interrupt the normal function of your front teeth and molars, and lead to tooth wear and painful jaw or joint problems. Open Bite: When your upper and lower teeth don’t touch when your mouth is closed. An open bite can cause poor or painful chewing, speech impairments, or temporomandibular joint disorder (TMJ). Overcrowding: When there isn’t enough room in your mouth for all your teeth to fit comfortably. This case can worsen over time and result in severely crooked teeth – it’s best to address this sooner than later. Without proper spacing, you are more susceptible to plaque, tooth decay, and gum disease. Crossbite: When your upper and lower jaw are misaligned. Misaligned jaws can cause uneven wear on your teeth, gum disease, and bone loss. Need some visual proof of Dr. Vanama’s Invisalign® magic? 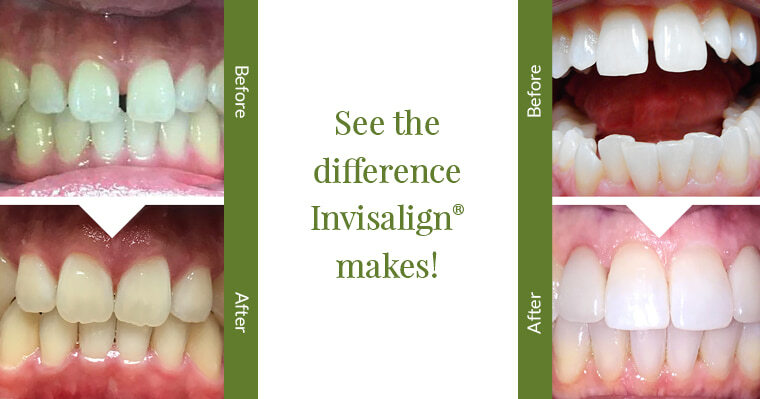 Here are a couple of our patients’ before and after photos with Invisalign®. Besides the obvious (aligners are nearly invisible), there are actually many benefits of Invisalign®. In fact, more than 5 million people are smiling with the help of Invisalign®. Treatment time: The average Invisalign® treatment is only 6-9 months. By this time next year, you could have a brand new smile! We also use Propel Orthodontics, which can cut your treatment time by three to 10 months (included in our current special offer). Affordable cost: Invisalign® is very comparable to other orthodontic treatments like braces. With our current promotion, you could save $2,400 off your Invisalign® treatment! Payment options: At Discovery Dental, we don’t want costs to stop you from getting the smile you want. To help you, we offer payment plans, welcome credit cards, third-party financing, and accept most dental insurance plans. Our new patient page has all this info and more. Teen insured: In addition to adults, teenagers can receive Invisalign® treatment. As a benefit to parents, blue compliance indicator dots are placed on teen aligners, which help you monitor your teen’s progress. Better health: Straightening your teeth can positively affect your overall oral health. Your risk of tooth decay and gum disease are decreased, and all those side effects of crossbites, overbites, etc. are eliminated. Life is easy: With Invisalign®, you can still eat, drink, and play sports as you normally would. Unlike braces, aligners can be easily removed so you can brush and floss according to your normal routine. Effective: Invisalign® is the world’s leading clear aligner. Its results are based on 20 years of research, 900+ patents, and the world’s largest 3D printing operation. Since 1997, Invisalign® has transformed 5 million smiles, including 1 million teens. Trust the process… and our patient. Hear from our stellar patient Pablo on his experience with Invisalign® in Issaquah, WA. Claim your Invisalign® special offer!